My husband and I moved to Minneapolis from WI just about 14 years ago. I come from the LaCrosse area, but we both met and went to school in Stevens Point. We have three amazing sons, ages 9, 6 and 4. I teach elementary classroom music part time in Minneapolis and I also play the bassoon, although not nearly as much as I used to. I am a dedicated knitter and I also spin my own yarn. We also like to spend a lot of time outdoors, biking, hiking and camping. I have been quilting now for hmmm.....maybe four years? I started sewing soon after my oldest son was born, making pajamas and tote bags. A few years ago a friend talked me (and Annik!) into joining up with a quilt-along on Oh Franson! 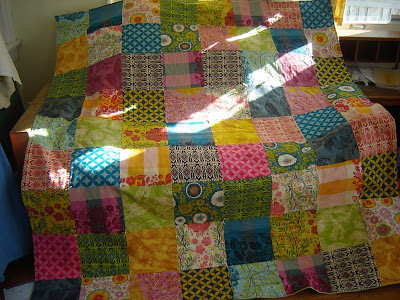 I learned everything from that tutorial and an amazing group of quilters that I manage to quilt with every few months. I'm on the low side compared to many in the group! 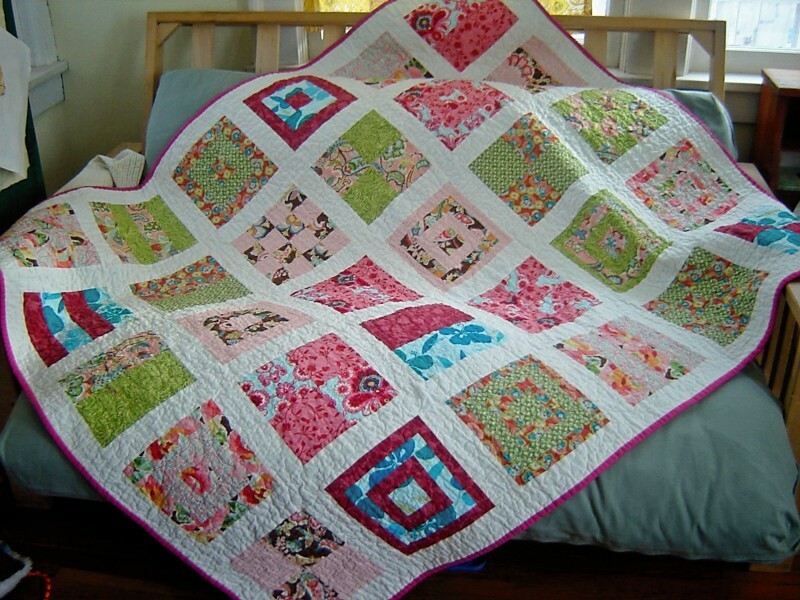 I have made only three completed large quilts and one mini quilt. But I have six cut out and in progress right now. One for a wedding, two for babies and two for me! Quilt for my brother's wedding. It really depends. I tend to knit first and foremost (do I dare admit that here? :-) and I sew in spurts, so I might go a month without touching my machine if I'm really into a knitting or spinning project. Other weeks I might easily spend 20 hours quilting. It was the Mod Square Sampler on Oh Fransson! and I used up a bunch of pinks and greens in my stash. I really think my favorite is the drag-along quilt I made. It's a huge tied quilt that I threw together in one weekend from Anna Maria Horner fabrics. I made is specifically to be a family quilt that can be dragged all over the house. So it's beautiful and it also makes a great fort! I sew in my sunroom. I'm lucky to have the entire room mostly to myself, although the household traffic goes right through it and the boys tend to play in there a lot. I have to remember to put everything away or it's fair game for my younger sons. They love to make things, but that also means they will easily grab whatever scissors or fabric is in reach. I usually listen to music or audio books. Coffee, tea or wine all work well! I bought a ton of fabric when I first started sewing. Lately I've been trying to limit it just so I can keep it all on one shelf. I tend to like to order collections and lately have been just picking up fat quarter sets of just a few favorites. Otherwise I'm mostly quilting from my stash. I love to piece my blocks, especially when I'm not using any set pattern, just throwing it together however I like. I also love to iron a freshly pieced block. I hate cutting! Hmmm......I'd say right now it's really just to quilt more often. 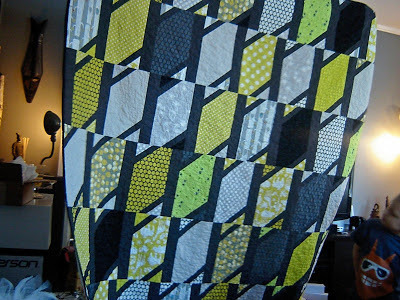 I'd also like to try paper piecing and try to be more deliberate in my free motion quilting. I also want to make a queen size quilt for our bedroom. Paper piecing looks like fun, but seems daunting at the same time. 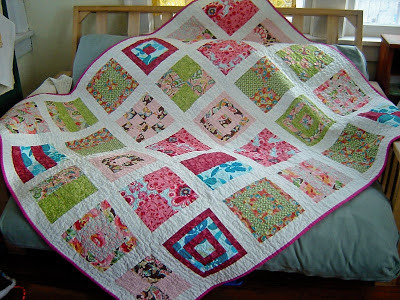 There is a lot I'd like to learn, but I tend to be pretty fearless in my quilting, I just dive right in an try it out. I"m not sure if that's a good or bad thing! Nothing inspires me more than just sorting through fabric. I start seeing fabrics I like together and it goes from there. I am also inspired when I have the idea to make something for someone. I try to see the quilt through that person's eyes and it gives me some new ideas. 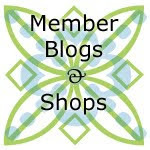 And of course the millions of blogs out there are always in inspiration, as is walking through a fabric shop! Just dive in and try it. Don't over think what you are doing.